So, Joe Frazier beat Muhammad Ali. The Grammys did their job. Order has been maintained. What happens next? Here are my predictions: Babel will return to the top of the albums chart next week. Jay Pharoah’s inevitable yellow suit-and-headband Frank Ocean parody will be relegated to “Weekend Update,” rather than get its own stand-alone sketch, on SNL. The guy from Fun. will regret wearing capris. A jingle that sounds like The Black Keys will appear in a Radio Shack commercial. Jack White will record a new 45 with three of the models from Robert Palmer’s “Addicted to Love” video. And nothing that happened Sunday night will matter when it comes to how our culture ultimately judges the value (or lack thereof) of these artists, or the many other artists who made notable music that had no chance of being nominated. No matter the cries from Channel ORANGE partisans, going the Mumford route was the only choice the Grammys could’ve made. Along with Taylor Swift and Adele, Mumford & Sons is the brightest young unit-shifter the record industry has going right now. Giving them a Grammy makes perfect sense, because Mumford exists in a context where industry honors actually sort of mean something. Now that this power trio of commercial dominance has been solidified, the Grammys can put them out on tour for the next several years. I feel like we can already pencil in Red for Album of the Year in 2014. As far as the Grammys are concerned, Gen Y–ers are the new boomers. Frank Ocean, bless his heart, made his allegiances clear with his truly bizarre performance of “Forrest Gump,” which was like an art-school deconstruction of what big, crowd-pleasing Grammy moments are supposed to be. This is clearly not a person that the NARAS can rely upon to be the young, non-white guy in a three-way with Paul McCartney and Carrie Underwood when the Grammys decide to do a Stevie Wonder–less tribute to Stevie Wonder for whatever reason next year. Frank Ocean has no idea where he’ll be next year. He’s supposedly deep into his next record, but I wouldn’t be shocked if it didn’t come out for another 22 years. This is what makes Frank Ocean an exciting artist. Mumford’s reliability is what makes it a Grammy winner. Taylor Swift did a British accent during her show-opening performance of “We Are Never Ever Going to Stop Finding It Tiring to Write This Song Title Out.” Most people assumed the shade was directed at her recent ex-boyfriend Harry Styles, of the British boy band One Direction. But don’t forget that Taylor also failed her audition to play Eponine in Les Misérables, a musical about French people where everyone sings in a British accent. Was this her way of proving to Tom Hooper that she can sing live with a British accent? Or has crossing over into mainstream pop given her the dreaded blonde pop star fake British accent that afflicts Madonna, Lady Gaga, Britney Spears, and Jenna Maroney? Frank Ocean wore a headband over a blue tuxedo shirt and a suit the color of butter. He was like Richie Tenenbaum playing at the wedding reception of a Starburst and a Skittle. Which is to say he looked sweet and edible. Who can say whether most of America knew what this sheepish kid in the snazzy attire was all about? His album Channel Orange was a hit, but it didn’t come close to taking over the world. Or the radio. Ocean didn’t become Justin Bieber, Adele, Fun., or Mumford & Sons. He didn’t even turn into Gotye. There was no single to spend the year trying to escape. But the scene of Ocean performing onstage by himself last night was arresting enough to make you wonder why you hadn’t heard of him or his music. Behind him was a big-screen projection of Ocean running down an open mountain road on the sunniest of days. The sky matched his shirt. While he stood and played, the image of his lower body in the same clothes appeared on each side of the box that enclosed the keyboard. There are faster songs on Channel Orange, more single-y ones. Take his strip-club odyssey, “Pyramids.” That would have been a production designer’s dream. But it’s almost 10 minutes long, and Taylor Swift had already spent the show’s Cirque du Soleil budget on the Mad Hatter disaster that opened the show. “Crack Rock” has voltage, but maybe it was too raw. The fact of the matter is that Ocean essentially was introducing himself to America. And there’s a way that the words “Forrest” and “Gump” also say “America.” But the song’s about a guy who’s super into Forrest — like, obsessed. And, as is wont to happen in high school, college, or at work, Forrest just runs away. From Ocean’s feelings. From his own. The headline that dominated Channel ORANGE‘s release was that Ocean was attracted to men — or that he was attracted to this one particular guy and the mutual feeling expired. Ocean spent the summer and fall singing “Bad Religion” on television, the song most ostensibly about that experience. And he often seemed wrenched when he did it. “Forrest Gump” is the last and most whimsical track on the album. Unlike “Bad Religion,” it’s so casually bereft that you initially fixate on the quirkiness of its conceit. But Ocean didn’t simply write a song about a boy in love with a jock. He wrote a song about a boy in love with a jock played by Tom Hanks as a lovable idiot in a movie everybody’s seen. It’s an eccentric way to say “A dude hurt me.” It’s also an eccentric way to say “A dude hurt me” in front of millions of parents who’ll have to ask their kids who the lonely-looking guy in the headband was. the way you disarm audiences is imagining them naked, but I don’t want to do that. I want to look at you all as kids in tuxedos and being fancy.” Not exactly Lionel Richie‘s American Music Awards “outrageous.” Still, opting to keep LL Cool J, Justin Timberlake, or Flo Rida suit-and-tied represents the height of decorum. The shakiness of Ocean’s singing couldn’t upstage the ground he broke. He stood on a Los Angeles stage and — casually, movingly, sincerely — told America that Tom Hanks broke his heart. 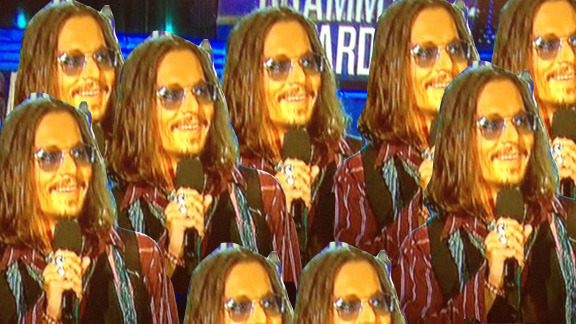 Johnny Depp has passed himself through Google Translate five too many times on the “Keith Richards” setting, and on that last trip, a fruit fly dipped in peyote buzzed into the query box, rendering the being spat out on the results page a freakish genetic mutation virtually unrecognizable from the actor who entered. The good news: The Sparrowdepp possess superhuman strength; the bad: It vomits a corrosively viscous substance onto its hashish before consuming it, which really grosses out everyone in the dressing room. Also, there are nine of them here, because I don’t know what’s real anymore. “After hours of fruitless bushwhacking, we came upon a clearing, perhaps 300 yards across and ringed by massive sandalwood trees. No sooner had we entered this twilight space than my two native guides, Ip and Porthos, became agitated and began gesturing toward a small stream at the far side. Clutching Old Matilda with my right hand, with my left I fitted my spyglass to my eye and took a long look. “There, drinking from the stream, was the biggest and fiercest Muppet I have ever seen. “Every hunter needs luck: luck with the weather, luck with the trail, luck with the seven or eight native porters charged with carrying your field piano so they do not slip and drop it over the side of Kilimanjaro in a January rainstorm, killing four of them. Our luck was that the wind was in our faces. The Muppet had not scented us. “He was a big male, perhaps seven feet at the shoulder and 14 feet long. His fur, which stood up in tufts, was the rich green of a polluted lake. From his terrible cheeks hung ringlets and horns and feathers. His nose was a mauve pom-pom. His eyes, two perfect spheres with black dots in the middle, stood atop his head like sentries patrolling a castle wall. “A Grouch, by God. A wild Mountain Grouch, the finest specimen I had ever seen this far from the Peruvian Andes. “Just then, Porthos sneezed, and the Grouch whirled to face us. Bellowing the ‘scram-scram-scram’ warning roar of his species, he charged with majestic speed, and even in my fear I marveled at the grace and power with which he came. Dropping the spyglass with a clatter I threw myself down behind a fallen sandalwood and lined up Old Matilda for the shot. Fortunately, I had a spare moment to aim while the Grouch was devouring Porthos, or it could have been a very near thing indeed. As it was, I squeezed Matilda’s trigger and felled the greatest trophy of my long career. and a coconut water, don’t give in. Let them cry. Let them scream. Let them embarrass you. If you don’t, your child may one day grow up to be a tall, witchy blonde person who dresses like a mad hatter and acts angry about being the biggest pop star in the known universe because guys don’t like kissing her. The thing about Miguel is that he has absolutely no narrative. Kelly Clarkson doesn’t know who he is, and neither do many other people, including several who love his hit, “Adorn.” So the margin of error for Miguel at the Grammys is razor-thin. One missed note, one awkward shimmy, just one odd wink and he’d have been done. The Grammy producers clearly didn’t trust him even for this intro-singing segment, so they integrated the gregarious, airheaded Wiz Khalifa to duet with him. Fortunately, Miguel has maybe the cleanest, purest vocal lines in popular music today. He crushed “Adorn” — the falsetto, the purr, the growl. Now Kelly Clarkson and your mom and other people know who Miguel is. Jay-Z holding a glass of cognac, laughing, wearing a scarf. OK, so I was wrong about Justin Timberlake’s comeback. I didn’t realize he was going to time travel. The winner’s murder tunnel. So, the Staples Center is very big. It can hold close to 20,000 people. Why, then, winners and presenters were forced into a tiny mouse hole upon exiting — and why exactly the producers at CBS thought it would be wise to reveal that they are temporarily housing precious cargo like Jay-Z, Rihanna, the Black Keys, and Carrie Underwood in this death-trap portal — is unclear. 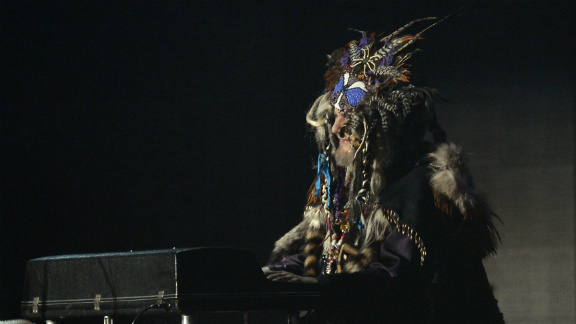 Dr. John has always been that weird and disconnected from reality and he has always been excellent. Here is “Gris Gris Gumbo Ya Ya,” which he recorded 45 years ago. I hope that backstage he mistook Taylor Swift for a felled bird and tried to make a headpiece out of her. 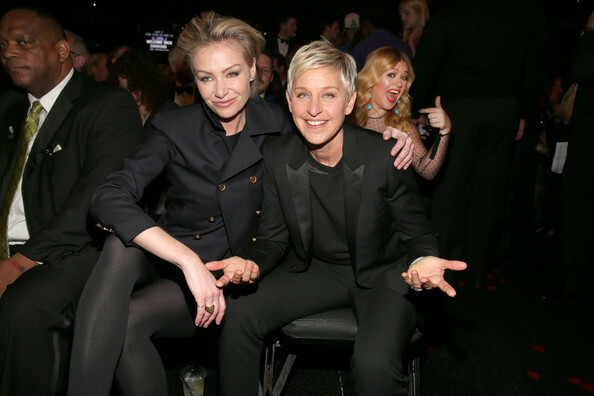 Portia de Rossi is a vampire now. The Bruno Mars–Sting team-up was surprisingly not-acrimonious considering Sting was quite clearly presented with complete evidence that Mars had lifted that stabbing guitar sound the Police made famous on “Roxanne” for his “Locked Out of Heaven.” There is a possibility Sting had never heard the words, though, as he flubbed the lyrics at one point. Another thing regarding Sting: People are probably going to have to come to grips with how influential he is in contemporary pop and R&B. He’s been déclassé for a decade or so — likely thanks to all the poetry books and Tantric chanting and the fact that he calls himself Sting. But that’s over now. If you need proof, go back and look at the people singing along to “Walking on the Moon.” That’s not even a top-5 Police song. All of the white people who sang along to the Bob Marley tribute are the real heroes. Especially Allison Williams. “Take that, Bon Iver.” —Katy Perry. Prince only has seven Grammys? Prince only has seven Grammys. Here is a complete list of all the worthy artists with more Grammys than Prince. At the end of The Exorcist, when Father Karras throws himself down those infamous steps in Georgetown, we thought that the demon Pazuzu was destroyed for good. I have to assume that the Staples Singers were in Washington, D.C., that fateful night, because Pazuzu has clearly been living inside Mavis Staples ever since. Frank Ocean doesn’t want to be a big-time, Grammy-fêted artist. You can see it in his awkward and retiring acceptance speeches and his slinking, meek gait. You can see it when he brings Tyler, the Creator and Earl Sweatshirt to sit with him in the fourth row. You can feel it when The-Dream forces his way in front of him at the podium. And you can hear it in his performance — off-key, dependent on abstract visuals, interior. That’s OK if he doesn’t want that for himself. Self-sabotage seems a strange choice, though. Taylor Swift’s real estate agent has been instructed to buy houses next to the following artists: Marcus Mumford, Bob Marley, and every Lumineer. for giving me the gifts that I have.” And finally Jay-Z, now and forever the coolest guy in the room, no matter what room, now matter what building, no matter what planet. It is certain to the 10,000th percentile he’d have just kept it moving if he hadn’t thought of that swap meet crack. But he did, and the cut-off music cut out for it, and now Dream’s Boyz n the Hood hat will rightly live in infamy forever. 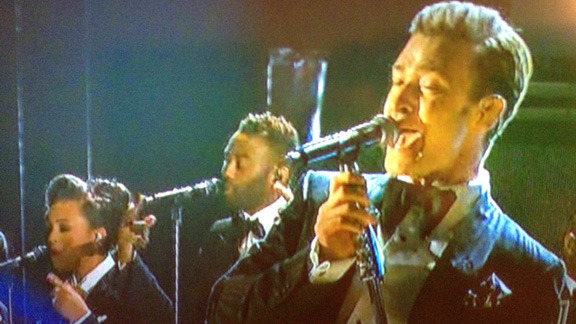 Who Did JT Get Pregnant With His Big Comeback Performance? 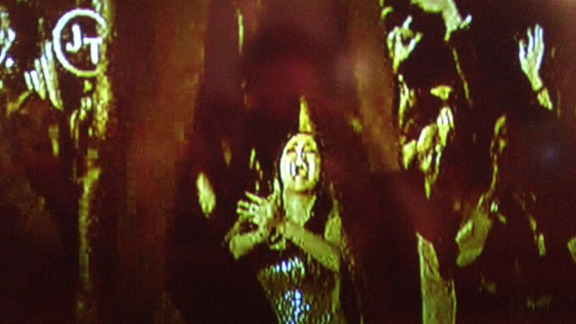 The sepia-toned girl screaming between his legs. 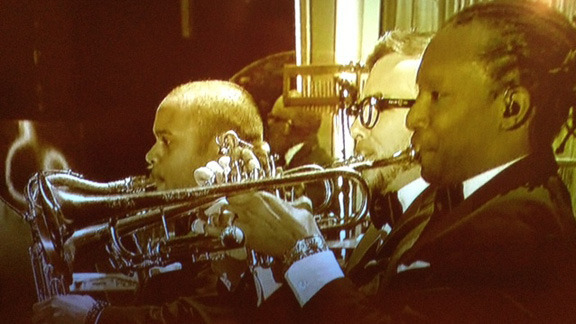 Two-thirds of his horn section. Young Background Tom Cruise, Jessica Biel, Beyoncé, and Jay-Z. 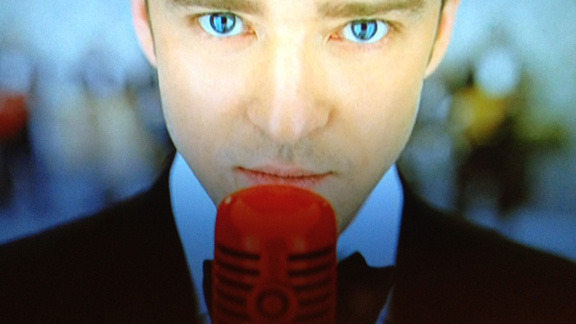 Justin Timberlake has a wussy speaking voice. Of all the slick ways the Grammys consistently got the viewing public to stay for the entire six-day awards show (putting Frank toward the end, alluding to a performance in which CBS LL Cool J turns into Def Jam LL Cool J and invites everyone in his fantasy football league to come perform), the most ingenious was the commercial break that casually announced Record of the Year would be introduced by Prince. It happened so fast, I thought I maybe dreamed it, because I want to live in a world where Prince is giving out awards to Frank Ocean, but after asking a few friends, it actually happened. Earlier in the awards show, during Justin Timberlake’s fantastic performance, I couldn’t stop telling those around me that JT was about the coolest guy on earth. I genuinely believe that. And then Jay walked onstage, FROM HIS SEAT, and reminded us all that he, too, is among the coolest humans currently living. Not only did this Siren walk out on that stage dressed like Captain Black Sparrow, but (as you can see in his right hand) was also walking with a bedazzled cane. And that still wasn’t the most impressive part. Halfway through his catwalk toward the microphone, as the audience stood up and cheered his existence, he paused to let the applause wash over him. Classic. And after about five seconds, once he was satisfied, he decided to start walking again. That diva move alone made the entire Beyoncé Experience: Live documentary look like an episode of King of the Hill. And Beyoncé knows this. 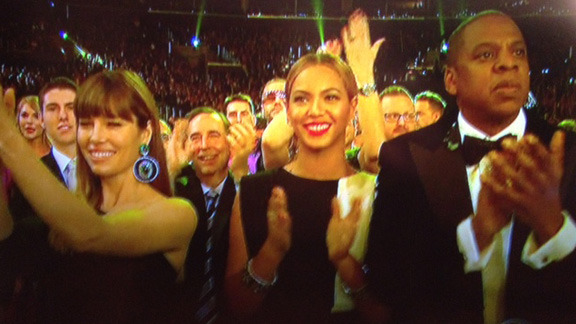 Because Beyoncé was there. But that still wasn’t the most impressive part. After finally making it down to the microphone, once the room began to quiet (because when Prince Rogers Nelson speaks, you listen), he opened his mouth. But he didn’t give some speech about how much of an honor it was, or some scripted piece about the importance of great records, or even introduce himself. THAT, MY FRIENDS, IS THE MOST IMPRESSIVE PART.